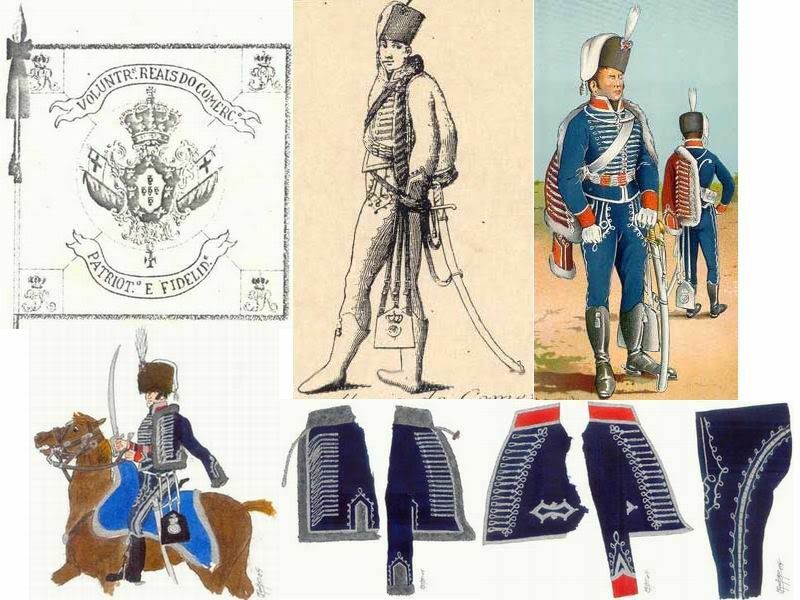 There are a few reasons why hussars were never been a part of the Portuguese Army, but the most important was the price of a uniform rather the unsuitability of it for the hot weather. 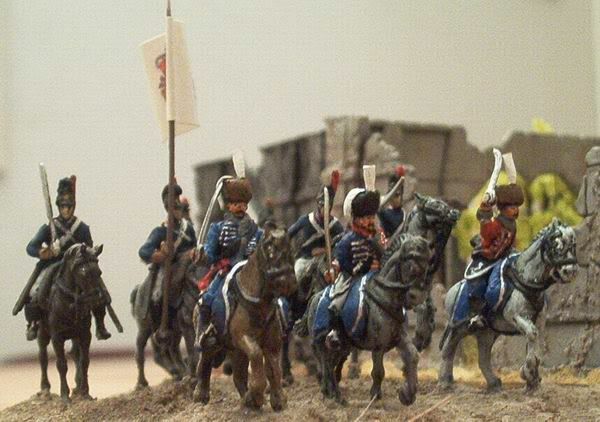 After the disbanding of the short lived Legião de Tropas Ligeiras which included 6 squadrons, the only hussar like unit in Portugal was the almost unknown small cavalry regiment from the Voluntários Reais do Comércio, composed of rich merchants from Lisbon. This small cavalry regiment was composed of 8 companies and was a militia unit with both police and military duties including the defense of the city of Lisbon. There was a reason for these volunteers to be raised instead of them joining the army or the militia. Most of them were rich traders or merchants and their commercial activity was extremely important to keep the country's economy as healthy as possible. If they and their employees joined the army, the economy would suffer heavily. But all agreed that should participate in the war in some way and it was a bad example not to just because they were rich. The Voluntários Reais do Comércio was the result of an agreement with the Crown, allowing the traders to personally contribute to the war effort while keeping their businesses running. A similarly dressed infantry regiment was also raised, with Hungarian like uniforms, but this unit seemed to have confined themselves just to police duties. 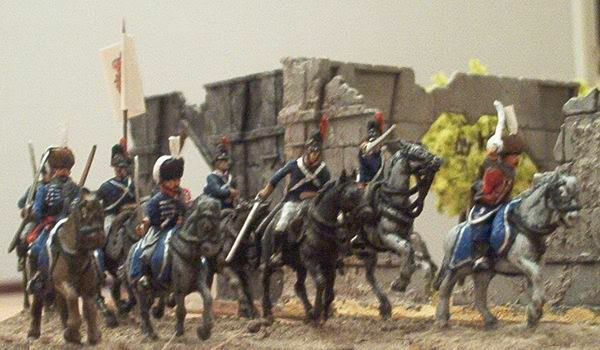 After the Royal Guard of Police joined the British and Portuguese armies a new order keeping force was needed and these volunteers replaced the former guards. There are very little information about the operational history of these volunteers, but is easy to believe that the infantry would never left Lisbon and that the cavalry should only be engaged in near battles. 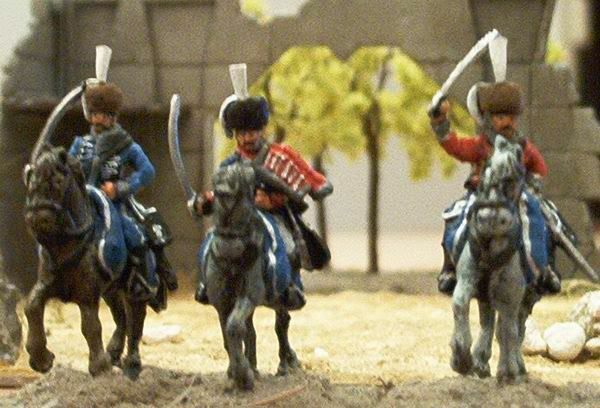 Apart from being dressed as hussars, very little and sometimes conflicting information gave just a few clues about the uniforms, with the major doubts concerning the colors. Most likely, the uniform was blue, with white trousers during the summer, however some sources mention brown, as worn by Caçadores batallions and even red. 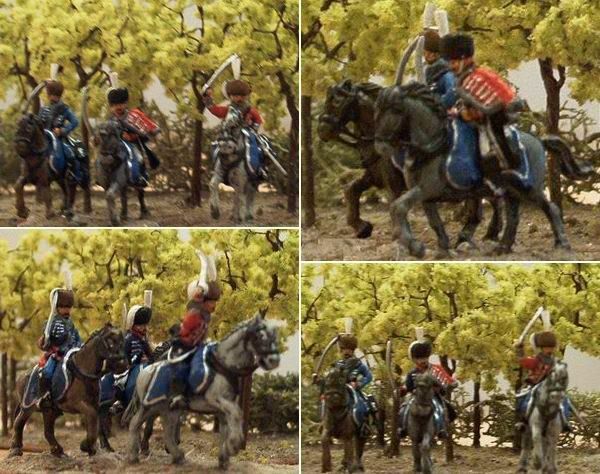 Even if we agree that blue was the correct color, it's possible and likely that it was a much lighter shade than the standard Portuguese uniform, similar to the light blue of several French units. Several sources agree that the coat was red, with grey fur and silver cords, details or highlights and all agree that a dark brown or black fur shako with white plumes was worn. The horses looked like those from the line cavalry officers, with similar shabraques and saddles, but made from a much richer material and identical leather harnesses. To make things even worse, as all men were required to purchase or source their own uniforms, standardization was very low, with whole uniforms or parts tailored to personal taste, while others bought them abroad or had access to captured French hussar uniforms. 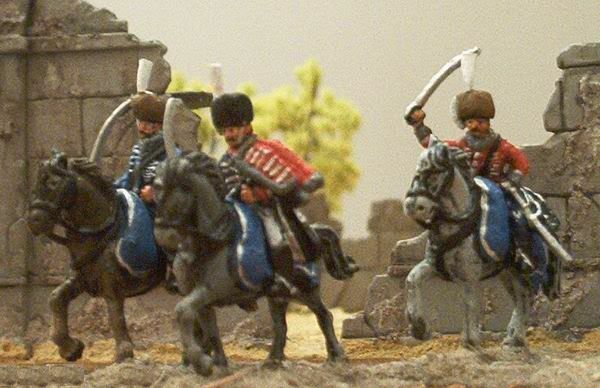 These three figures include what are likely to be worn, but nobody is absolutely sure about what was really the uniform of these hussars since almost nothing remain from the original documents that would help to get a clearer picture or more reliable informations about these volunteers. Many thanks to Mr. Nuno M. Cabeçadas.